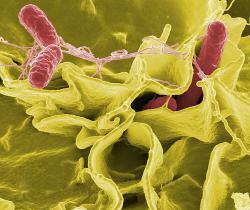 Salmonella invades human cells: Color-enhanced scanning electron micrograph showing Salmonella typhimurium (red) invading cultured human cells.Courtesy Rocky Mountain Laboratories,NIAID,NIHMore than half a billion eggs were recalled after Salmonella sickened over 1600 people (according to the Center for Disease Control, or CDC in September.) That’s a lot of eggs, and a lot of sick people. What is this nasty bacteria that makes us wonder whether we should let our kids eat raw chocolate chip cookie dough, even as we sneak several spoonfuls when they’re not looking? Salmonella enterocolitis is one of the most common types of food poisoning and is caused by the bacteria Salmonella Enteriditis. You can get a Salmonella infection by swallowing food or water that is contaminated with the salmonella bacteria. Often, the culprit is surface contamination from raw chicken and raw or undercooked eggs. In most people, it causes diarrhea, fever and abdominal cramping, but young children and those with weakened immune systems are at greater risk of dehydration and more serious infections. Why don’t they just wash the eggs better? Salmonella bacteria live in the intestinal tracts of animals and birds and can infect the ovaries of healthy-looking chickens. This allows bacteria to infect the eggs even before the shell is formed and voila- you have a pathogen that can’t be washed off of the egg because it’s inside. Salmonella bacteria are often found in the “white” of an egg, although they can migrate to the yolk as the raw egg sits in your refrigerator. Organic and free range chickens have less disease than factory-”farm” raised chickens, partly because of healthier diets and less crowding. Cooking eggs until the yolk is solid kills Salmonella bacteria. How can you make your cookie dough and eat it too? Buy pasteurized eggs (you can find them at most grocery stores) that have been heat-treated to kill bacteria, but are still essentially raw for all cooking and baking purposes. Also, remember to wash cutting boards you’ve cut meat on with soap and water before cutting anything else on them, or just have separate cutting boards for meat. Don’t forget to wash your hands after handling raw eggs! Pet food and reptiles can also harbor salmonella bacteria, so have your kids wash their hand after handling either! Bacteria are everywhere. Some keep you healthy and some make you sick, but making good decisions in the kitchen can keep you and your family from being affected by food-born illness! sorry to freak you out and stuff but its true. dude you need information on the cell like its structure and functions. Talk about its life span and who discovered it when you are talking about what is salmonella.